Biotechnology is the use of artificial methods to change the genetic material of a living organism to produce different products and different functions. Biotechnology is commonly known as the scientific manipulation of living organisms, especially at the molecular level. Transgenic animals are when their genome has been deliberately altered by a gene or a group of genes from another species or breed. They are produced by numerous methods, the three basic methods are DNA micro-injection, retrovirus-meditated gene transfer, and embryonic stem cell-meditated gene transfer. The most common method is through DNA microinjection. This is the process of taking the DNA of a different or same species and injecting it into the pronucleus of a fertilized ovum. Inserting the DNA is random and there is a high chance that injected gene will not insert itself into a site on the host DNA that will permit it’s expression. Retrovirus-meditated gene transfer involves using retroviruses as vectors, an organism that transfers a disease from one animal to the genetic materials or a cell, to another. A retrovirus is a single-stranded positive-sense RNA virus with a DNA intermediate and, as an obligate parasite, targets a host cell. Offspring from this method are chimeric, and not all cells carry the retrovirus. Embryonic stem-cell mediated gene transfer involves prior insertion of the desired DNA into totipotent stem cells from the embryo (stem cells that can develop into any type of specialised cell). This method results in a chimeric animal; animals that are produced by the merging of multiple fertilised eggs. 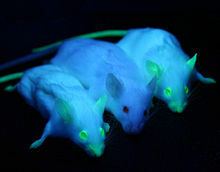 Transgenic animals are normally used for experiments and research in laboratory. Over 95% of these animals are rodents, mainly mice. They are best used as models in biomedical research for the research of human diseases, but are also used for agriculture and industry. Transgenic animals can be used to cure diseases such as diabetes. The method used is called transplantation which takes the cells in the animal that produce insulin, which is made from beta cells in the pancreas and transplanting it to the diabetes patients so they won’t have to inject the insulin. They can also be used to replace people’s hearts, liver, or kidney, this process is called xenotransplantation. Transgenic pigs are used for that process, currently the process is hampered by a pig protein but research is underway to replace that with a human protein. This form of biotechnology is giving us better medical treatments and will also be improved in the future. In this picture, a mouse grew an ear on its back which can be cut off and donated to someone who needs an ear. Agriculture was time-consuming for farmers but now that the molecular biology was made, it was easy to develop traits in animals in a shorter period and with more precision which is an easy way for farmers to increase yields. The quality of products that animals produce has also improved to be healthier. For example, transgenic cows are able to produce a natural protein in their milk that kills the bacteria that cause animal mastitis which is inflammation of the mammary gland in the breast or udder. Pigs and cattle that have more meat on them, sheep that produces more wool also exists. In 2001, two scientists at Nexia Bio-technologies in Canada spliced spider genes into the cells of lactating goats. The goats began to manufacture silk along with their milk and secrete tiny silk strands from their body. The silk can be weaved into threads, and the scientists can use that to make products such as military uniforms, medical micro-sutures, and tennis racket strings. In conclusion, transgenic animals play a critical role in developing and creating new drugs for diseases, as well as providing food that has more nutrients and products that are better quality.